Choose from 3 Sizes. Guaranteed in 4 Hours. One of our most popular sizes, these dumpsters accommodate virtually any small to mid-sized residential or commercial project. At a height of 4 ft, it’s easy to load; yet it holds approximately 3.5 tons of trash and materials. These are the largest of all Western Elite dumpsters. They are ideal for larger interior home renovations, household cleanups and commercial construction or renovation projects. Our roll-off container systems work best for customers with large volumes of bulky, non-compactable waste, such as construction refuse, scrap steel, glass, concrete, pallets and wooden crates. With Western Elite you can expect to find a variety of inventory and flexible, responsive scheduling to handle your fluctuating volumes. Available in the three above sizes, our roll-off containers can help you tackle any job, from construction and demolition projects to home or office clean-outs. 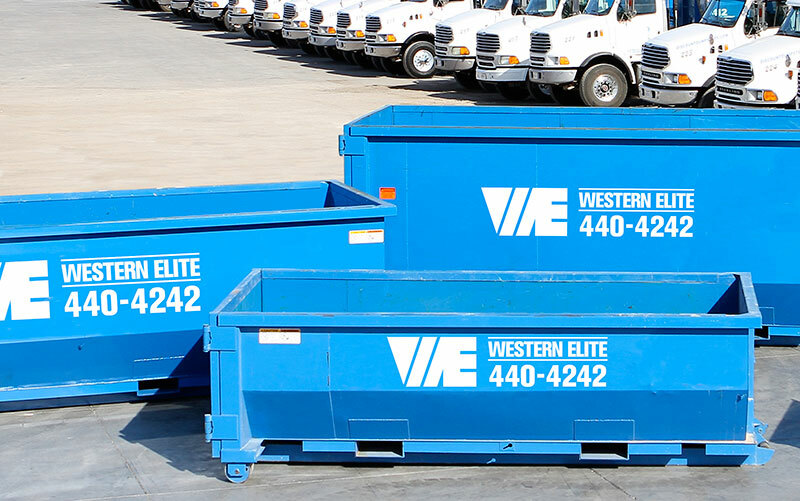 The following material is generally acceptable for disposal in a Western Elite Dumpster without the need for special arrangements: municipal solid waste, construction and demolition debris, and yard waste. Hazardous materials, toxic substances, pollutants, contaminants, infectious wastes, medical wastes or radioactive wastes defined by applicable federal, state or local laws or regulations. Not sure about the status of your waste? There are many types of waste material that-because of their physical characteristics, chemical make-up or biological nature-require either special handling, disposal procedures (including liquids for solidification at the landfill), documentation and/or regulatory authorization, or pose an unusual threat to human health, equipment, property or the environment.